Food shaped pillows and blankets are all the rage right now. If you’re no longer satisfied with these just in your belly, how about surrounding yourself with your favorite dishes. 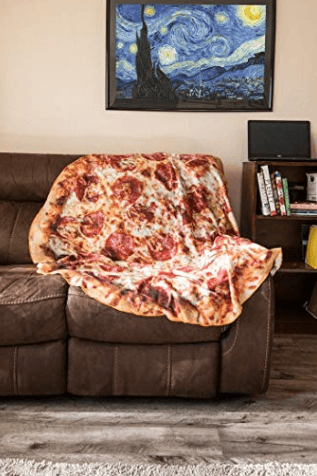 Perfect for late night snacking, err, shopping, on Amazon right now you can purchase “realistic-looking” 60-inch round blankets imprinted with a giant cheeseburger, donut, or pizza. Reviews for the $40 to $56 items, which come in take-out delivery style boxes, are pretty resounding. “I folded into a slice and it makes me hungry!” said one, while another joked, “Super soft like a baby otter that so happens to look like a pepperoni pizza.” What’s the strangest impulse purchase you’ve made?